How to control syringe pump using stepper motor? 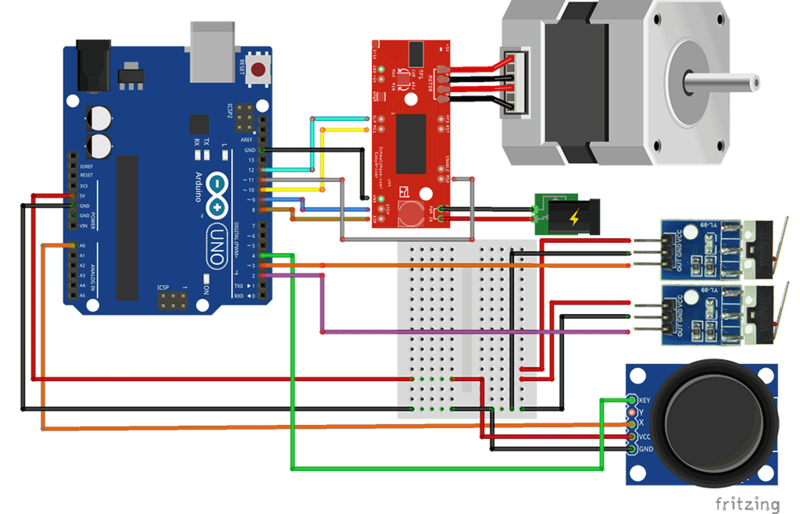 Arduino, easy driver and stepper motor, joystick and limit switch? Since the commercial syringe pumps are so expensive, several people have already made their own projects and attempts to build much less costly devices, especially in recent years, when 3D printing is becoming more widely available and cheaper, and the DIY scene is booming. The following selection of examples of such project tries to briefly cover a few of the most interesting open source ones published on the internet. The first example is a project made by a team of graduate and undergraduate students at Michigan Technological University, lead by Associate Professor Joshua M. Pearce. It seems to be one with the most serious approach and documentation, they even released a paper about it. The pump is constructed using customizable 3D printed part designed in OpenScad and NEMA stepper motors are controlled by Raspberry Pi with web user interface. The next example is a pump developed and published on instructables.com by user naroom. The pump (Figure 2.6) is mounted on a aluminum rail, which provides the possibility of fitting it on various mount setups, but at the same time makes the whole pump rather big and clumsy for transportation. The holders are 3D printed and designed parametrically in OpenSCAD, and thus easily redesignable. Prototyping board Arduino Uno R3 is used for the control, with a shield and enclosure box for mounting on the rail. Stepper motorized peristaltic pump, syringe pump, piston pump, metering pump are widely developed because of the precise and cost effective results.